ALL-NEW JUMPING-ON POINT! A SPECIAL FOUR-ISSUE EVENT! "OPERATION: DEADSIDE" STARTS HERE! In December of 2015, a covert military intelligence unit sent a team of 20 agents and one special operative into a parallel dimension. Only one came back. The purpose of their mission was classified. 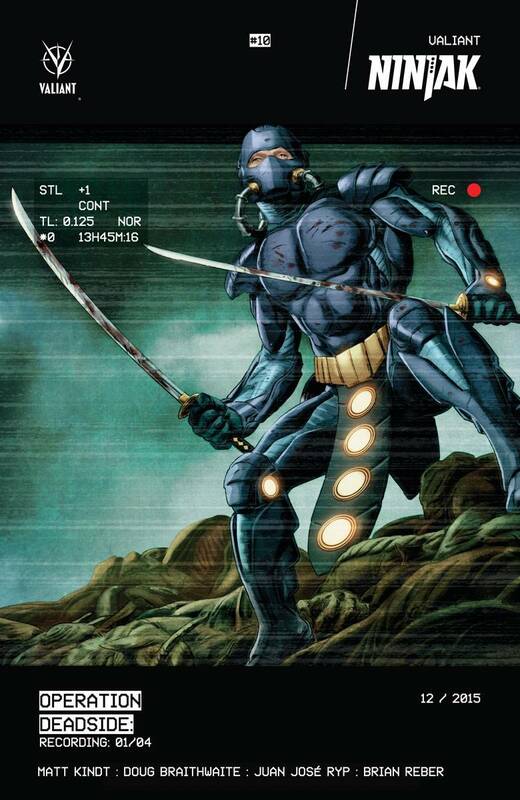 Now, out of options, MI-6 has recruited their most elite operative - codename: NINJAK - to follow the doomed mission's sole witness back into the dimension called Deadside...and bring her missing teammates home. What will they find there? And who will be waiting for them? Jump on board here as New York Times best-selling writer Matt Kindt (DIVINITY) and superstar artist Doug Braithwaite (ARMOR HUNTERS) reunite for a terrifying journey into an unknown plane of existence...and bring NINJAK head-to-head with SHADOWMAN in the all-new, four-part epic "OPERATION: DEADSIDE"! Plus: an all-new chapter of "THE LOST FILES" begins, featuring explosive artwork by Juan José Ryp (Clone)!